Self proclaimed "fairy beer mother" Kendra is the community manager of one of the fastest growing companies in Toronto -- Steam Whistle. She's responsible for producing the excellent online content that comes out of the brewery and is the voice behind the hugely popular social media accounts. I sat down with her and asked for more details about her dream job. 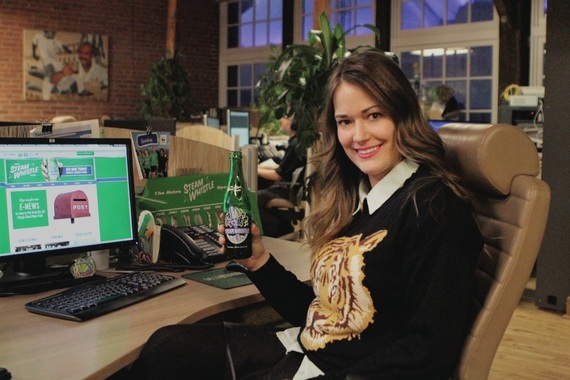 Self proclaimed "fairy beer mother" Kendra is the community manager of one of the fastest growing companies in Toronto - Steam Whistle. She's responsible for producing the excellent online content that comes out of the brewery and is the voice behind the hugely popular social media accounts: Facebook (over 32,000 fans), Twitter (over 34k followers) and Instagram (over 10k followers). And if those numbers aren't proof enough of her success, just speak to any one of Steam Whistle's extremely loyal fans (myself included). Caitie Drewery: So what does your day-to-day look like? Kendra Nicholson: I develop our online content and manage our social channels as well as handling customer service and taking care of our super fans. (Aka playing fairy beer mother). My job involves tweeting about beer all day - not a bad gig! CD: And what was your journey to get where you are? KN: I actually went to school for fashion design. Post-graduation I realized the industry was not for me (after too many frustrated nights in the sewing lab). I made the transition to cosmetic marketing for 3 years. At that time there was a shift towards digital and brands were starting to realise they needed a dedicated person to manage how their brand was represented online. As someone who spent more time on Facebook and Twitter than hitting the books through college I thought - that's my dream job! I took a few online courses and accepted a job managing the social feeds for a collection of boutique hotels and resorts and did some consulting work before landing the gig at Steam Whistle. CD: That shift within companies of recognizing the importance of digital brand management has been very interesting to watch, but companies certainly still have some learning curves. What are some of the challenges you still face in digital marketing? KN: When I was first starting out in social media the most frustrating question I was asked daily was "What is the Return on Investment (ROI) of social media? I think the reason people ask the question is because they don't understand the true value of the payback. The investment in social media and digital marketing leads to brand awareness, product feedback, community engagement and customer service. Can you assign a dollar value to that? CD: And how did you overcome those ROI hang ups? KN: I would advise anyone asked to prove the value of social media to counter with what specific Key Performance Indicators (KPI's) that are important to their business goals. Are they looking to increase follower count, engagement, reach or are they looking to build a thriving community amongst their customers? Once you have an idea of what social success look like to them you can provide actionable goals to take them there. CD: What is the company culture like at Steam Whistle? KN: I consider myself very fortunate to work with a team of people who not only value social but can also teach me a thing or two. 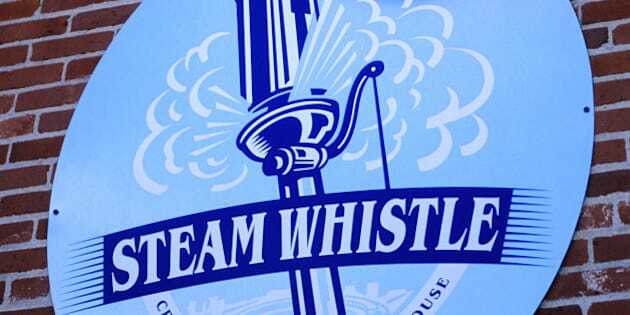 Steam Whistle is a collaborative open-doors environment where everyone's ideas and opinions are encouraged. We have employees with decades of industry experience working alongside newer employees who are adopting and teaching cutting edge technologies and apps which leads to a very well rounded dynamic. CD: What is your one piece of advice to young bucks out there? KN: Never stop learning! Being new to the beer industry I needed to put in some work to gain my bearings, I just wrapped up my Prud'homme Beer Sommelier course. I attend webinars weekly and digital conferences as often as I can. I think it's naïve to assume you know everything about an industry and if you work in digital your industry changes every hour. The people who get left behind are those who aren't constantly evolving and adapting with the world around them. CD: What does the word "millennial" mean to you? KN: To me the concept of a millennial is someone who has lived half their life with the internet and half without. There is inherent value in the ability to balance all that technological aptitude with IRL relationship building. While correspondence through e-mail can be the most convenient our best ideas at the brewery come from face to face brainstorming sessions. Having a couple beers can certainly help the creative process too! CD: What has been your biggest FTW moment? KN: For the second time we've been ranked the second Most Engaging Canadian Beer Brand on Twitter and 3rd on Facebook. That accomplishment felt great, both as the only craft brewery on the list and also because we do everything in-house at Steam Whistle. It validates that pre-designed memes and scheduled tweets will only take you so far. Ultimately what people are looking for is real life human connection. In an era when people are expecting automation - people lose their mind when a beer company actually tweets back! CD: Bonus question - what show are you binge watching right now? KN: Over the holidays I binge watched Making a Murderer (just like everyone else). I was left with many questions... Specifically does Steven Avery actually not own any underwear? "The investment in social media and digital marketing leads to brand awareness, product feedback, community engagement and customer service. Can you assign a dollar value to that?" "Ultimately what people are looking for is real life human connection. In an era when people are expecting automation - people lose their mind when a beer company actually tweets back!" "To me the concept of a millennial is someone who has lived half their life with the internet and half without. There is inherent value in the ability to balance all that technological aptitude with IRL relationship building." "I think it's naïve to assume you know everything about an industry and if you work in digital your industry changes every hour. The people who get left behind are those who aren't constantly evolving and adapting with the world around them." Next week, meet Drew Campbell, Marketing Manager of Digital at Boston Pizza International and learn about building your own brand and what it's like be a kid in a figurative candy store (which in Drew's case was the Cannes Lions International Festival of Creativity).